Can you not be bothered to stir your "fruit on the bottom" yogurt? Instead, do you love Yoplait yogurt like I do? 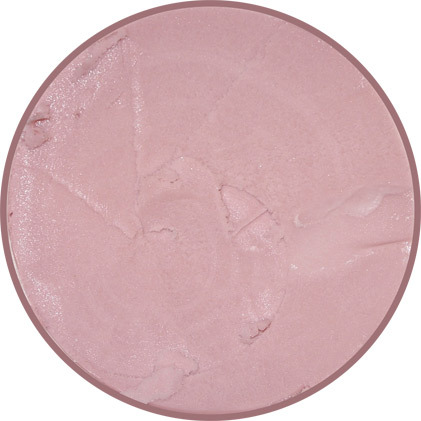 Have you ever taken that tasty Raspberry Yoplait and shoved it in the freezer to see what happens? Well, I haven't, but if I did, I'm pretty sure it would taste almost identical to Adonia. The fine folks at Ciao Bella have decide to jump into the greek frozen yogurt game just like so many others this year. I think what might set them apart from the others is that they come from a gelato & sorbet making background. Look closely at the container --- 9 grams of protein per serving! That's just crazy! 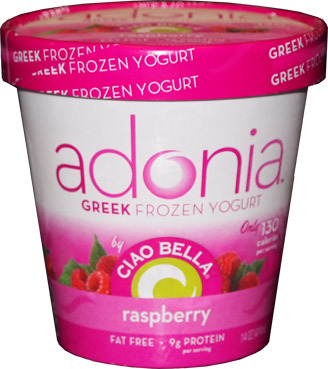 Most refrigerated greek yogurts claim "2X the protein" over regular yogurt, yet here is Adonia being the first to finally bring that protein mojo to the frozen side. Sure, B&J has 6 grams, but 9 grams? That's just awesome. Quick disclaimer: This is a faux pint unfortunately (only 14 fl oz). I cant say I was really enjoying my serving. It's not that it's bad, it's just boring. Sure there's no artificial fillers or flavors, its a clean enough taste, but it's like eating cold yogurt. I'd rather just go eat my yoplait. I'm guessing this will be a hit with the health crowd, but for those of us looking for a treat, and not just something cold, there's nothing here for ya. On Second Scoop: Ok, the health benefits of this one make me think I need to try again. I still wish I had some grape nuts or granola handy, but I do have a box of graham cracker crust.... and... oh I added too much. There's just no texture pizzazz in the yogurt, even when I swirled everything together. I wonder why they went fat free? Just a little milk fat and this stuff might rock. I forgot to ask you if you noticed ciao bella went to using faux pints now. I'm happy that this was disappointing to be honest. I was considering adding a pint to my ice cream source purchase since I doubt I'll see it around here. Now I don't have to think what if when my order comes aha. I've been meaning to try these. Could you still scoop it out, or did it break into chunks like if you literally froze a container of yogurt? It looks like the additional protein content comes from the added milk protein concentrate rather than from it being a greek style yogurt. now that you mention it, it did kind of scoop in small chunks, even after I left it melt... though in Adonia's defense I was just using a small spoon. Maybe the gelato background isn't a good thing? I'm sure it will have a following, I just won't be part of it. Just trying the espresso version, very creamy and only a hint of coffee taste. Very nice overall. Was ultimately disappointed with the raspberry like you were.